Each month during the upcoming year, St. Katharine Drexel will highlight a church ministry. We kick off the year with a look at the Father Jon O’Brien Council of the Knights of Columbus. January 14 marked an important day for the Father Jon O’Brien Council of the Knights of Columbus. With the support of local Knights from other parishes, a special Charter Ceremony signaled the official launch of the Council. Father Murphy served as Ceremony Chaplain and shared his excitement about the establishment of the Father Jon O’Brien Council, named after St. Katharine Drexel’s long-time celebrant instrumental in the growth of the mission. In a ceremony presided over by Knights of Columbus District Deputy Craig Radcliff, newly appointed Grand Knight Greg Murray was presented with the framed chapter declaration. Thirty-four charter members from the Father Jon O’Brien Council were in attendance for the event. Through the work of Father Michael J. McGivney, the Knights of Columbus was officially chartered as a fraternal benefit society in 1882 under the founding principles of charity, unity and fraternity. The Knights of Columbus is one of the largest fraternal charitable service organization with more than 1.9 million members in over a dozen countries. Members are Catholic men who come together through faith to support their Church and local, national and worldwide causes through charitable action. A driving force behind the creation of the Council, Craig Radcliff explained that, “efforts to form a Knights Council began when SKD parishioner Patty Kuntz notified him that Father Murphy expressed interest in the formation of a Council.” From that point on, you could find Craig in his red jacket talking to current and future Knights after Mass. With strong support from the parish, things moved quickly. In January 2017, the SKD Round Table was formed. This past September, the Father Jon O’Brien Council #16793 was created. The Knights got to work immediately in October, sponsoring and running the first St. Katharine Drexel Fall Festival with over 300 parishioners in attendance. During Advent, 21 members from the Father Jon O’Brien Council assisted the Our Lady of the Rosary Council in selling Christmas trees at Holy Trinity Church which in turn donated $2,000 of the proceeds to the Council. That leads us to January 14, when the Charter Ceremony took place with support from the Bishop Flaherty Assembly & George Brent Council. An active Knight and an officer with the Fourth Degree, Greg Murray’s responsibilities as Grand Knight include coordinating the installation of officers and members, appointing committees, monitoring programs and activities, and scheduling services for departed Knights. “Our guiding principal is charity,” explained Greg Murray. “Activities focus on the Parish, Catholic Church and community.” Mutual aid is offered to members in need, and fellowship is promoted among members and their families through educational, charitable, religious, social welfare, and public relief works. What’s up next for the Father Jon O’Brien Council? Murray shared that future plans include efforts to support KOVAR, a Virginia Knights of Columbus Charity that provides support for individuals with intellectual disabilities. During Lent, a dozen Knights will be working at the All Saints’ George Brent Council Lenten Fish Fry to raise money for KOVAR. The Knights are also planning other events focused on parish youth, diocesan Seminarians, Culture of Life events, the House of Mercy, and the SKD community. Membership in the Knights of Columbus is open to men 18 years of age or older who accept the teaching authority of the Catholic Church, live according to its precepts, and are in good standing with the Church. There are four degrees within the Knights of Columbus. Each degree ceremony imparts a lesson on the Order’s core virtues of Charity, Unity, Fraternity and Patriotism. Fourth Degree Knights participate in funerals, baptisms, Confirmation, local parades and community events, and activities in support of the Bishop. Those who are interested in learning more about the Father Jon O’Brien Council are encouraged to approach a fellow Knight after Mass or visit the Knights of Columbus website. “We are looking forward to growing our Council and we invite parishioners to get involved in this faith affirming organization,” added Murray. The Saint Katharine Drexel Knights of Columbus Council meets on the third Thursday of the month at 7:00 PM at the Mission Office moving February 1st to 4100 Millcreek Road in Haymarket, VA.
It’s not too late to join in the Book Study, “Christ the Life of the Soul” by Blessed Abbott Marmion. The book study group will take place one Sunday a month during Religious Educaiton class hours (9:10 – 10:15AM) starting January 21. For more information, please contact Martha Prokop, Director of Religious Education at mprokop@saint-stephen.org. 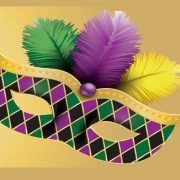 Save the date for the 3rd Annual SKD Mardi Gras Ball on Saturday, March 2, 2019. Tickets go on sale in January and all proceeds will benefit the SKD Building Fund. Donations – please consider donating items for the auction. Contact Dianne at (703) 966-3583 or Mary at (703) 675-3665 to donate items, sponsor the event, or purchase advertising in the Auction Catalog. All donors will be thanked in the bulletin and at the end of the event. Day of Event Volunteers – setting up auction items, table decorations, assisting with checkout. Please email Casey at cparker@amberridgellc.com to assist. Graphic Design – assist in the layout of the bid sheet and auction catalog. For questions, please contact Casey Parker at (571) 239-8001. As many of you know, St. Katherine Drexel Mission has been working diligently towards the goal of building a permanent home for our Catholic community since early 2014, when the Building Committee was formed. Our progress thus far is the direct result of the financial sacrifices many of you have made plus your prayers and support. Since these efforts started, we have made amazing progress – both on the building project and towards becoming an active parish where we gather to worship God in fellowship as we share our Catholic faith. To build a thriving parish, we need not only a physical building but also a strong sense of belonging and community. Father Murphy, the members of the Building Committee, and I would like to take this opportunity to provide you with a brief update, let you know what we’ve done this past year, and the exciting things planned for 2018. Our project is estimated to cost $8M, which includes the church building, sitework, and furnishings. The Diocese of Arlington purchased the land, a 28 acre parcel at US Route 15 and Route 234, and closed the deal in December 2015. We are very thankful for the tremendous support we have received from the Diocese. To initiate construction, we need approximately $4M in cash and pledges. The $4M balance can be financed through a Diocesan loan (similar to a mortgage). To date, we have approximately $1.6M in cash and pledges; we need to raise another $2.4M. The Special Use Permit issued by Prince William County in November 2015 requires us to complete site planning by November 2018 and complete the project (i.e., fully move in) by November 2023 at the latest – hopefully much sooner. We anticipate the construction schedule to take 24-36 months in total, depending on sequencing, funding, and other factors. We anticipate sitework could take 12-18 months to complete and building construction could take 18-24 months. If funding permits, we can begin sitework in late 2018/early 2019, concurrent with building design. Building construction would follow thereafter in the 2020/2021 timeframe. This gives us about 2-3 years to raise the rest of the money. The sooner we raise the money, the sooner the project gets done. It’s that simple. 2017 was a very productive year. Although you did not see physical progress (excluding the new, larger sign erected in early December), many enabling activities occurred in the background which are essential for project success. As with any large project (and this is a large, complicated project), it is not simple and it takes time, patience, money and some luck. Conceptual Design was initiated in 2016 and completed in early 2017. The conceptual design further defined the general arrangement and overall look and feel of the small to medium church (“Phase I” of our overall project). The renderings were displayed at Mass in January/February 2017.Conceptual design enabled us to more closely match our requirements, preferences, and configuration of the church with our budget. Based on the conceptual design and our estimated budget of $8M (sitework and building construction), we made some adjustments to the scope (mainly in finishes and support spaces) to make our goal of building a church affordable and achievable. The contract for site planning and design efforts was placed (through the Diocese) with the Civil Engineering firm of Ross-France-Ratliff in late September. A detailed survey of the plot was completed in November 2017 and based on the survey, site design (utilities, septic, water, parking, entrances, exits, landscaping, etc.) started in late November and are continuing now.Site Design entails developing additional details of the building so it can be integrated with the Site Plan and conform to the Prince William County Special Use Permit requirements.Site planning is complicated – there are many county, state, federal, and other regulations to follow – along with numerous and lengthy regulatory reviews. The federal reviews are a result of the presence of wetlands on our site, an “intermittent stream,” which the US Army Corps of Engineers has jurisdiction over.Site planning process will be complete in August/September 2018. Prince William County will then issue a permit enabling us to start sitework, if we choose. The Special Use Permit requires us to be complete with site planning by November 2018, so we anticipate being ahead of schedule. The decision to start sitework is dependent on fundraising progress. After site planning is complete, we can then move onto more detailed building planning. Alan Walker spearheaded development and installation of a new, much more prominent sign on the site alongside Route 15, and relocated the existing sign to the Waterfall Road side of the site. He received a lot of help erecting the sign in early December from his fellow parishioners pictured along with Alan in the photo. Many thanks to Alan and his colleagues! (Pictured below: SKD Sign-Raisers (L-R): Jim Etro, Martin Fisher, Dennis Corrigan, Tony Bocchichio, Alan Walker. Not pictured: Pat Lorzing (photographer) and John Stirrup (who was working furiously away in the background…). Our fundraising efforts continued apace. Many parishioners are fulfilling their capital campaign pledges and building fund contributions at a good clip. We held our first Mardi Gras Gala in February 2017 at Evergreen Country Club and it was a huge success. Casey Parker led the effort and the Gala raised $30K! Better yet, it was a lot of fun. We hope you join us on February 10, 2018 for the next one! Coincident with the Building Committee’s efforts, the Fr. Jon O’Brien Knights of Columbus Council was formed. Bill Bartheld initiated the effort and was ably assisted by Pat Lorzing, and many others. Along with the Knights, a Legion of Mary Chapter was formed in late 2017 led by Jackie Lorzing and other parishioners.The Knights and Legion of Mary help provide an essential framework for the parish to form stronger bonds, promote socialization, and perform good works in keeping with our Catholic mission. As our efforts and the project have matured, the Building Committee has established several formal subcommittees to better pursue our cause. These subcommittees include: Fundraising, Communications, Social Activities, Design and Construction, and a Knights of Columbus Liaison.You’ll be hearing from each of the Subcommittee Chairmen/Chairwomen in the coming weeks on their goals and efforts to seek your support.You’ll also be seeing more communication on a regular basis on our project and fundraising status. Fundraising is our biggest challenge. We need money to make this project a reality and it will only happen with funding. It is likely those of you who are here already have given. Our challenge is to reach those who have not given yet or who are new to the parish. Only about 40% of the parish is actively contributing. Anything more than $0 counts! We need to improve our participation rate significantly and are confident we will. Although this project may not have all the funds we need now, it will get built, even if it does take a bit longer than we wanted. So be patient, give what you can, and pray for God’s guidance. To help this effort, we are developing a fun and innovative approach to fundraising – which relies on your support and participation in a number of ways. On January 20th (Saturday) from 1:00-2:00 PM, we are holding an organizational meeting at the Mission Office. Please contact Ellen at the SKD Mission Office at (703) 754-8444 or via email to RSVP. We hope to receive our site plan permit in the fall of 2018. This will allow us, funding dependent, to bid the sitework and potentially start sitework in 2019.Along with the site plan permit, we will evaluate when and how to start church design and develop a more detailed project schedule. Following on the success of last year, the Mardi Gras Gala is planned for Saturday, February 10, 2018 (Saturday) at Piedmont Golf Club. See the Mardi Gras page to purchase your tickets.And based on the great success of the Knights of Columbus Fall Festival in October 2016, the Knights are planning more fun social activities for 2018. Keep your eyes peeled for updates! Thanks for all your support and prayers. Wishing you a blessed New Year! P.S. – If you would like to contribute to the Building Fund, please visit our FaithDirect page to setup a single or on-going contribution. Thanks for your support! Experience this extraordinary 33 day journey to Marian consecration with four giants of Marian spirituality: St. Louis de Montfort, St. Maximilian Kolbe, St. Mother Teresa of Calcutta, and St. Pope John Paul II. Fr. Gaitley masterfully summarizes their teaching, making it easy to grasp and simple enough to put into practice. He weaves their thought into a user-friendly retreat that will bless even the busiest people. 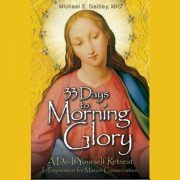 So if you have been thinking about entrusting yourself to Mary for the first time or if you are looking to deepen or renew your consecration to her, 33 Days to Morning Glory is the right book to read and the perfect retreat. We will consecrate together on February 11, 2018, the 160th anniversary of Our Lady of Lourdes between Masses at Bull Run Middle School. We will meet Thursdays starting January 11 at 1:00 at the Regency in Dominion Valley. Please contact Jackie Lorzing to register at Jackie.lorzing2011@gmail.com or 703-754-3859 / 703-565-7295.